I work in the IT industry, and it often surprises people when I mention that my academic background is as an historian. Looking back on my school career, when I came to choose options for A-levels I had a fairly open choice between “arts” and science subjects, and I just went with my strongest interest – history. That extended on to university, where I studied Modern History. When I was visiting my in-laws in Poland recently, they unearthed a couple of fascinating booklets – fascinating to me, anyway, since one of the the countries I specialised in during my academic studies was Russia and the Russian Revolution, covering the early 19th century through until Stalin’s death in 1953. The book on the left (published in the same year I was born!) presents a version of Lenin’s life, in the voice of a father talking to his child. It’s a highly and unsurprisingly romanticised account, talking about his struggle to free the poor, and how very hard he worked… ending with a note about how sad everyone was when he died, but how his ideas are remembered – “work and life are organised according to the new system”. The booklet on the right, published a year later, contains a number of stories. I’ve not had all of them translated to me, but one story involves Lenin getting a Christmas tree for all the poor children! 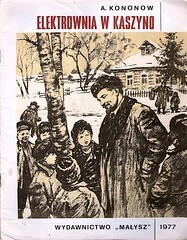 This portrayal of Lenin as the hero of the poor working classes, friend to children everywhere, is classic stuff – I’d read about the way in which his image was manipulated in order to romanticise and legitimise the Communist system, particularly under Stalin and his successors, but here I had two booklets which were being used as recently as 30 years ago to teach my wife and her siblings (although not all of them remember it so vividly, given that the Berlin Wall fell in 1989 and Poland is now celebrating 20 years of democracy). The back pages of each booklet contain the publishing information noting that they were printed in “ZSSR”. The Communist themes, symbols and colours are prevalent. Of course, it also elevates Lenin to an almost religious position of reverence, ironic given the Marxist opposition to religion, but convenient for Stalin’s purposes in the 1930s, 40s and 50s. I felt very strongly that it was worth preserving them, so I engaged in a little digital archaeology / restoration with the aid of a scanner and Apple’s Pages 09. Talking to my wife, she remembers these books being read to her as a child… she told me that she remembers her mother not seeming exactly sure about them or keen to tell the stories, but looking back she can see that it was because it was not the done thing to speak out against the materials – if her child had gone to school making comments against comrade Lenin it would have been a problem! I do have to wonder just how many of the portraits of Lenin can ever have been legitimate. 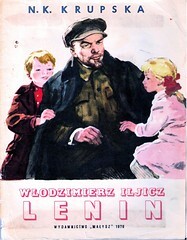 I particularly like the images of Lenin the worker and Lenin the family man. Absolutely fascinating. It’s absolutely true that my own initial views of Poland were based on the grey news footage of Solidarity strikes in the 1980s, and when I first went to the country in 2002 I was astonished to find how “modern” and vibrant a place it is – of course, I can now see that I was just seeing the place through the filter of 15-year-old news coverage of a period of unrest and hardship, in a particular region of a large country. What I know now about the way people lived is based on memories which are fast slipping away. I can talk in very broken Polish to my wife’s grandmother who lived through the war and remembers it; to her parents about the hard times they lived through; and get the occasional remark about my wife’s childhood. Materials like these books make it much more real. I hope you’ll find them as interesting to think about as I did, even if you don’t understand every word written inside. EU to restrict Internet access? For the past week my avatar image has changed to show one of the logos of the Blackout Europe campaign. “What’s that all about?”, many folks have asked me in the past few days. Well, as I understand it, this is the situation: the European Union is debating a set of measures called the Telecoms Package. This package is set up such that ISPs will in future be able to parcel out Internet capabilities to consumers in much the same way that satellite and cable TV companies do today – so, for example, there is a possibility that in future you will not pay a flat rate fee and have access to “everything” online, but you might have “starter package” with a certain range of sites plus, say, Skype access, and a “gaming package” which would give you access to various online games services, and a “pro package” which enabled all sites plus any services you wanted. Basically, they will be able to filter what you are doing based on site or protocol – those are just some examples I thought up rather than anything known to be in the works. How does that differ from Internet packages in Europe now? Well, right now there’s no real differentiation between the services and sites that can be accessed, although there are often speed limits and download caps. This is potentially a fundamental change to the way in which access to the ‘net might be regulated and controlled. It’s all a bit technical, but for more detail see this page on the Blackout Europe blog and look under section 6 for a set of annotated PDFs which discuss the measures in detail. You can also read the open letter already sent to the EU Parliament. It’s a hypothetical situation, and as several folks have pointed out to me over the Twitter stream, it might be pretty difficult to actually implement. Other people have pointed out that the site itself “looks unprofessional”, which I suspect is more a factor of translation and time than anything else. I don’t think either of those two issues should really stop people from registering their discontent at these proposed changes. There are forms available on the site to enable people to contact MEPs. I’m late in blogging this, as the deadline is really in the next 24 hours – frankly, I’m surprised that the site, Facebook page and other social networks haven’t attracted more attention. The press release about the Telecoms package makes it all sound very reassuring and good for the public, but as ever, the devil is in the detail. Unfortunately, it’s an openness that is fairly subtle for non-technical people; above all, it’s not at all obvious to politicians, who seem to assume that apparently minor tweaks won’t change things much. At least, that’s the most charitable explanation for the fact that European politicians are on the brink of passing legislation in the current Telecoms Package that will destroy a key part of that openness, by allowing telecoms companies to discriminate in the way that they handle IP packets according to their type. One of the issues that still exists with the EU is the visibility of the institutions and processes at a national level. As a supranational organisation, it’s commonplace for people not to be aware of what is going on in the Parliament, even though in my experience, the EU’s web presence actually provides a great deal more transparency and insight into what is happening in Parliament than many national governments. People tend only to respond to EU legislation once it has been enacted and then re-enacted within their own national context. So, there are a whole bunch of things going on at an EU level that most people in European countries pay no attention to unless they are picked up by the media, and even then only if enough noise is made about the issues at hand. It’s not too late to take a look at the site, and contact your MEP to let them know how you feel about freedom of access to the Internet – get the amendments that neutralise the offending clauses in “the Telecoms package” passed.